I GOT THROUGH THE THRESHOLD of it now! #achievementunlocked … Zolaman victory poses all around! Thank you, Baguio’s ever growing food industry … growing and turning old houses into restos, more specifically. Wee! So I’m inside the house-turned-restaurant in our second attempt at recon and I was both so elated and impressed at the size of the dining area. \m/ There are two nicely decorated sections where you can corral your party of foodie lovies if it happens to be a big one. Like the TARDIS it was, “smaller on the outside”. Annnd I’m just talking about the first floor here. There’s more renovation on this old house going on in the lower floors (soft opening phase at this time). Greek coffee, milder than what Race is used to but still a good ‘cup a Joe’. The first appetizer X+1 tried was a mouthful to say: Kolokithokeftedes. I just pointed it out from the menu to our attendant since I didn’t want to get it wrong saying it. Tongue twister. These zucchini fritters (that looked a lot like misshapen fried green tomatoes) with tzatziki sauce gently prepared our tastebuds for the new dishes we were going to sample. What a view. Uh-oh, rain clouds looming. What would a Greek restaurant be without Greek salad, all Baguio’s freshest greens (and reds of the tomatoes) with an equal ratio of feta cheese and unpitted olives in a bowl. The Inception bottle of balsamic vinaigrette and olive oil. Wee! No worries on the pits interrupting what would otherwise be the monotonous motion of chewing because they do have a role in keeping the olives firm. (I find pitted olives on the mushier side. I would know, I snack on ingredients remember? *hihi) With its fruity juices coming together with the feta and the other veggies, it’s a memorable salad, one we’d like to have almost every time we see it on the menu. We picked out the mixed versions with meats like chicken, pork, beef and lamb resting on sliced pita bread and covered with the Greek chef’s secret (wonderful, wonderful) sauce. Three cheers for more stuffed veggies! I love stuffed stuff! The pepper and tomato in this Greek cuisine eating place was cooked in the oven so long, it looked like they were ready to explode. Since I’m not a real fan of fresh pepper, I relished in the veggie being well cooked. Oh, the toasted/charred top of the capsicum. A dash of salt (for Ms. Salty here) on the risotto-in-tomato-sauce looking rice stuffing and I swooned. Bechamel sauce and ground beef went around with both the pastitio and the moussaka mains. Looking at the plate of Greek pasta, I was reminded a little of the baked mac takeouts we had from Tummy Fillers; good times, good times. As for the moussaka, this passed with flying colors with my niece who had recently tried a strange one (moose kaka? =)) ) from a restaurant in Manila. These layers of potato, eggplant and beef from Lemon and Olives tasted so good together in a forkful. X marks Lemon and Olives Greek Taverna for good food in Baguio. Ώπα (OPA)! Service: Here’s hoping the attendants soon get the hang of watching the tables as they get more experience in the soft opening … so they could refill glasses of water like clockwork, for one. Or, they could just leave a pitcher of water on the table, that would work, too. Price: Not so big fat Greek servings with heaps and heaps of food we can share with the whole family. I had a feeling the whole time, I could eat the garden salad for sharing, poikilia appetizer sampler, the moussaka, the pastitio, and maybe a souvlaki all by my wittle self. The resto’s amphitheather vegetable garden below. Looks like the lettuce Rapunzel’s mother had pregnancy cravings on in old Ladybird story books. =b Beautiful! I am an Ian! Just playing with you. A magnificent write-up about new restaurants in Baguio as always. I hope I can visit Lemon and Olives Greek Restaurant one of these days. Thank you so much for visiting the blog and reading the newest post on Lemon and Olives Greek Taverna! Xine, thank you for the food tour of what they have at Lemon and Olives Greek Taverna. You weren’t joking when you said big fat Greek feast. 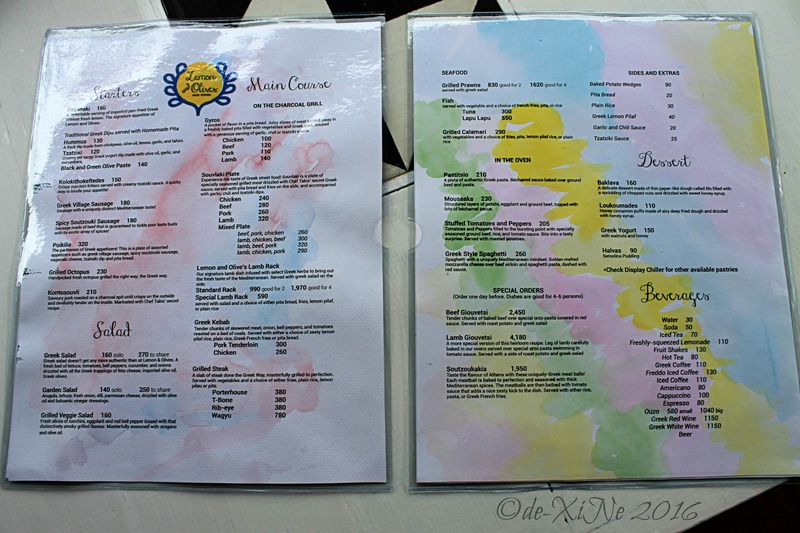 Iknow exactly what we are going to get when we visit this new baguio resto. Hello there, Candy! Nice eatsplorers like you, always welcome! Thank you so much for visiting the blog and reading this post on Lemon and Olives. I have been following your food blog for some time now and I must say I truly appreciate how you tell it like it is. Not everything is peaches and cream eating out. I also like that your posts do not read like a menu description or puff pieces for the restos you visit. Good job. Next resto … post coming soon. Till then, how’s about trying the newest Pancake House offerings that come with metro Baguio homegrown specialties as ingredients? Just published the post now. =b Exclusive to Baguio branches for a certain time before launching to other branches. I will read pancake house post first. *hihi Mine too, lacked padding, after. Great blog. Im a Charo from Greenwich, I would like to ask if you have a blog group thats based in Baguio?